Our range of non-rechargeable batteries, also called primary batteries, will support your daily essential tasks. Within this section, you will find market-leading brands including Duracell, Energizer and Panasonic, supported by our own RS Pro range. How does a non-rechargeable battery work? In its most basic form, a battery is an electrochemical cell that converts chemical energy into electrical energy by means of negative and positive electrodes. An electrolyte - essentially a liquid that conducts electricity – facilitates the movement of ions between these electrodes, producing an electrical current via the battery terminals. Non-rechargeable batteries are disposable as they are designed to be used only once (primary). Once the reactants inside are used up in chemical reactions, the output gradually falls. Once all the reactants have been used up, these batteries are no longer able to supply electrical energy. Used in so many different applications across industry, commerce and domestic settings, batteries are used to provide power sources in a whole of host of places, including personal computers, vehicles, handheld devices and white goods. They can be categorised by letter designations, voltage and chemistry. 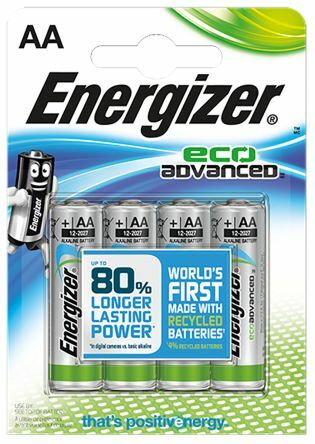 AA batteries - one of the most common standard battery sizes available on the market today. They're cylindrical in shape and readily available. AAA batteries - also cylindrical in shape but smaller in size than an AA battery. Coin button batteries - small round batteries that are usually used to power small portable electronic devices and watches. 9 Volt batteries - square in shape, known for use in smoke detectors. Alkaline - Very reliable and inexpensive battery chemistry that has a good long-lasting shelf life. They are able to provide a high current output and have a good high and low temperature performance. Lithium - The batteries can be more expensive in comparison to alkalines but have a higher energy storage density. They're suitable for high current demand applications and the output voltage is constant during discharge. Lithiums have a very long shelf life, with loss of capacity of approximately 0.5% per year. Maintaining batteries is important to help ensure the life of the battery. Keeping the batteries stored properly and in a dry, cool place – not necessarily in the refrigerator – is a good idea. It is also important to check the batteries you have in your devices periodically, as they may be getting to the point of corroding. Replace batteries regularly, even before they wear out fully, so you do not have to worry about this.